Jack Stoll has been named to the 2018 John Mackey Award Preseason Watch List. The sophomore tight end received the recognition Friday. The Mackey Award is presented to the most outstanding tight end in college football. 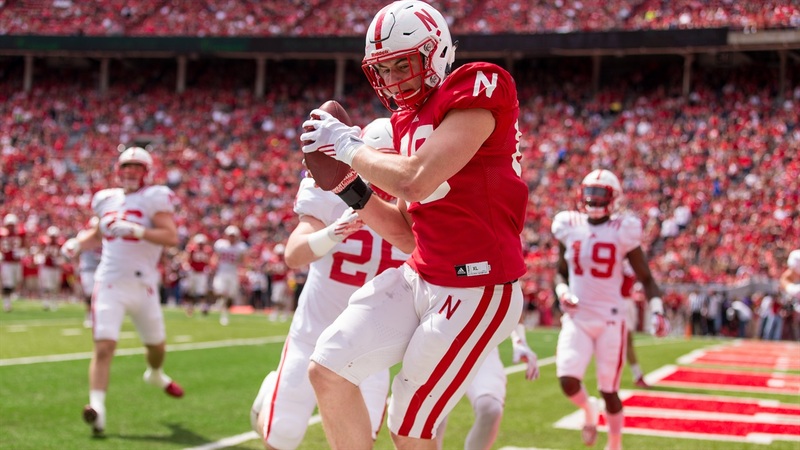 Stoll is Nebraska's lone returning letterwinner at tight end. While the tight end position has plenty of question marks for 2018, tight ends coach Sean Beckton previously said the group is "coming around." Stoll is expected to play a major part as a leader of the group. “He’s always been a tenacious blocker with attitude, and he brings that to our offense,” Beckton said during the spring. “The biggest thing for him is adjusting to being more of a receiver and he’s doing extremely well there. We’re really excited where he is; he’s understanding how to maneuver underneath coverage and catch the ball down field. Stoll played in 12 games as a redshirt freshman. He caught eight passes for 89 yards and two touchdowns. Eight of Stoll's receptions came in the final six games of 2017, including touchdowns against Northwestern and Penn State. The 2018 Mackey Award receipient will be named on Dec. 5, 2018. The award will then be presented live on Dec. 6 at The Home Depot College Football Awards Red Carpet Show on ESPNU.